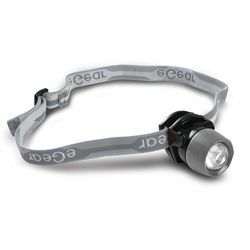 See where you're going in hands-free style with the eQ2 long-running LED headlamp. You can strap around your head or clip it to a hat or helmet; it weighs less than an ounce so you'll hardly notice it's there. Choose the flashing or steady modes... either way, you'll get at least 16 hours of run time on a single set of batteries. Includes clip mount and adjustable elastic band. Requires 2 CR2032 coin cell batteries, included.